Perennial. Zone 4/5. Boraginaceae. Syn. Borago orientalis. Bulgaria, Turkey, northern Asia. Something of a bio plant (“botanical interest only”) but one which I am intrigued by, having long had a strong affection for the members of the Boraginaceae as a whole. Deep green, crisply wrinkled, rather bristly leaves arise in early spring, along with many 6-inch stems topped by loose spikes of many small, star-shaped blue blooms with curiously reflexed petals and prominent stamen clusters. A rich nectar source, the flowers are a favourite of foraging bees. 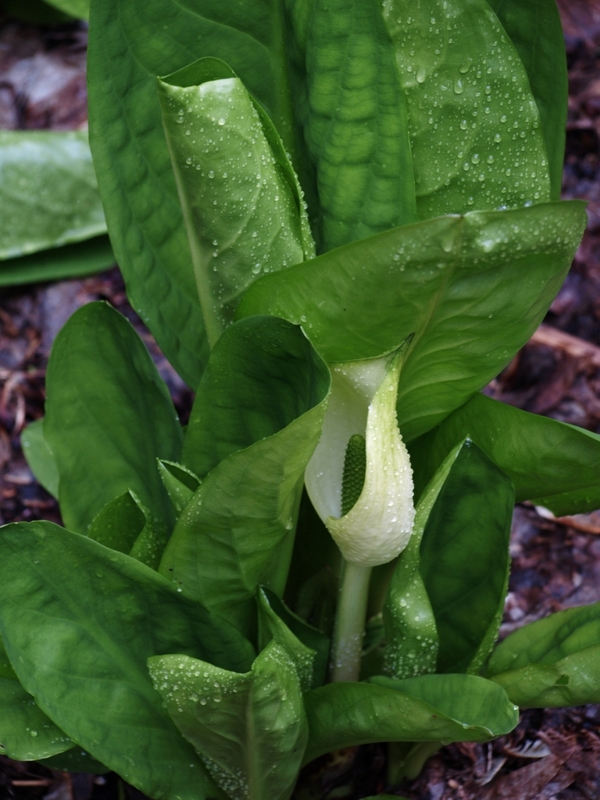 Once the flowers subside in May, the foliage expands to form a dense colony of 18-inch long, bright green leaves, reminiscent of a colony of furry-leaved hostas. Most literature dismisses Trachystemon orientalis as hardy only to Zone 6, but properly sited, in humus-rich soil in areas with reliable snow cover, this one is worth a try in our region’s Zone 4-ish woodland gardens. A fine example of Trachystemon orientalis can be found in the David C. Lam Asian Garden here at UBC. The coarse-textured, heart-shaped leaves are bright green and reach 25-30cm long. However, it is the dainty blue flowers, currently in bloom, that are the most striking feature of this perennial groundcover. The flowers are held on hairy, purple flower stalks of 15-30cm in height. Flower stalks emerge in early spring (March-April) before the leaves have reached full size. Individual flowers are about 1cm in diameter, and are hermaphroditic – meaning they have both staminate (pollen producing) and carpellate (ovule producing) structures. Stiff hairs and blue flowers are typical features of members of Boraginaceae. Trachystemon is derived from the Greek trachys, meaning rough, and stemon, a stamen. The species name orientalis means eastern or from the orient, and is a reference to the native distribution of this species. Trachystemon orientalis is endemic to southeastern Europe and western Asia. In Turkey, the plant is eaten as a vegetable, and has the common name aci hodan. The flowers, stems, young leaves and rhizome may all be cooked and eaten. English common names include Abraham-Isaac-Jacob, and Eastern or Oriental borage. From a horticulturist perspective, this plant is an extremely useful groundcover; while it prefers partly shaded woodland locations, it can tolerate full sun to shade, and a range of soil conditions. It even performs well in dry shade which is always a challenge for gardeners. 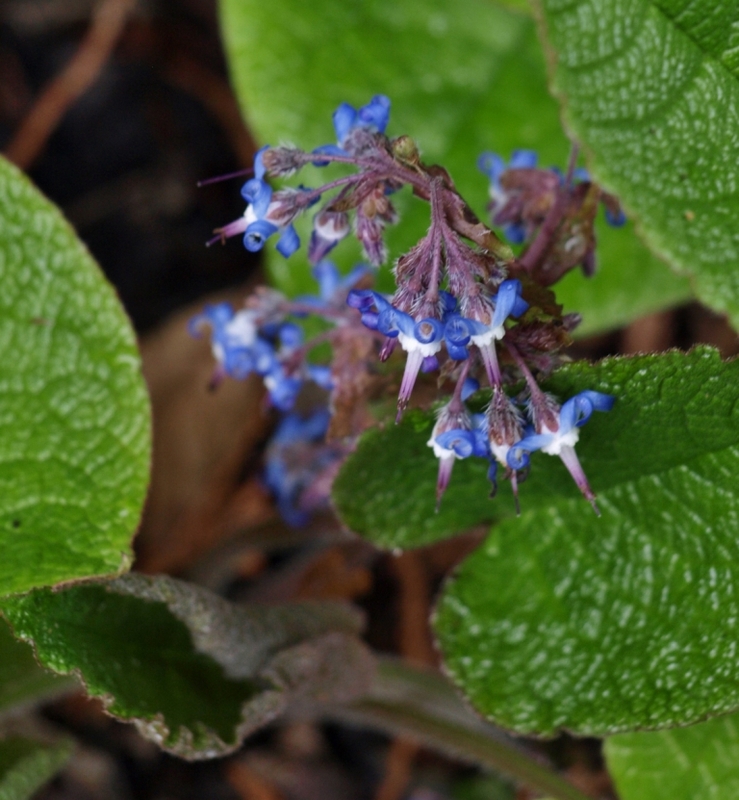 Trachystemon orientalis grows in forested and subalpine areas of its native lands, where it is collected in early spring as a much-loved delicacy. It is sold in the local farmers’ markets and prepared rather like spinach, though I would fervently hope that the overall bristly texture is subdued by cooking. This plant is highly edible and grows in the Black Sea mountains in Turkey. Much like spinach it needs a very good soak and rinsing several times because of the bristles. It is a lovely food, stem and flowers included, when chopped and added to sautéed chopped onions then whisked eggs stirred in and allowed to cook through. Salt and pepper to taste. It is a seasonal plant and not available except by foraging for it. (The common name in Turkey is) ‘Kaldirik’. Grown as an ornamental in Great Britain since the 1860s, it was reportedly introduced to North American in the 1970s by renowned plantsman John Elsley, who has been instrumental in introducing many new-to-the-continent species and cultivars to the North American nursery trade. Still very rare in the nursery trade in Canada. Reported to be easy from seed, so a good place to start would be the various alpine garden club seed exchanges, or keep an eye out if visiting a coastal specialty nursery. Hill Farm Nursery hopes to be able to offer this plant in the future. A test planting is in the ground as of fall 2014. Perennial. Zone 3. Araceae. Western North America; California north to Alaska; throughout British Columbia from coastal regions to lower elevations of mountain ranges. This spectacular native wildflower emerges from its winter hibernation before the snow is completely gone, appearing in wet and swampy areas in April and early May. Tight-packed green flower spikes are enclosed in a large, bright yellow bract. Pollinated by flies and beetles, which are attracted by the musky fragrance of the flowers. Club-shaped seed pods mature in late summer. Foliage is strongly pungent when bruised, hence the common name. Massive, glossy, fleshy fleaves are 3 to 4 ft. tall. Excellent for those with larger gardens, and adds early spring interest to the bog garden and pond edge. Prefers shade. A moisture lover, which demands wet feet to be happy. Fairly slow growing, but long-lived and maintenance free where happy. 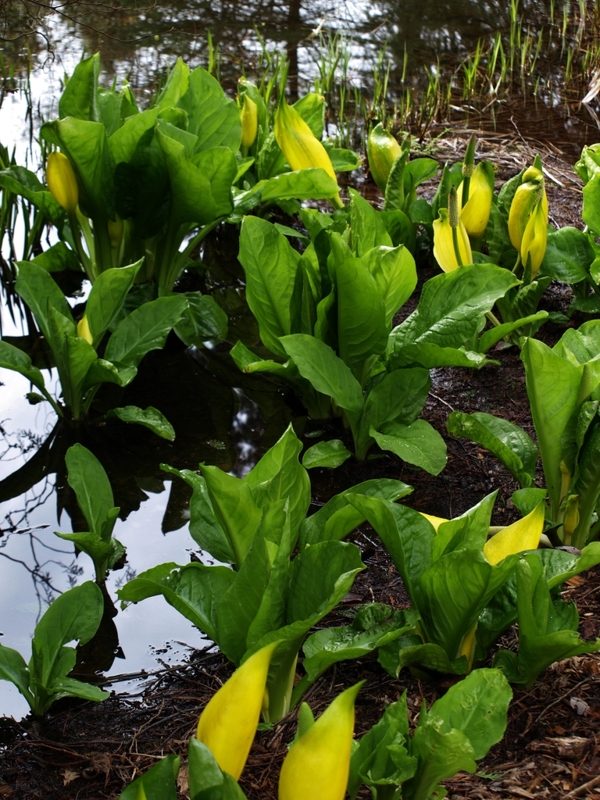 Yellow Skunk Cabbage may be found in our in the wild in our area in wetter regions, generally where cedars thrive. Look for it in the bush around Likely and Horsefly, and in lower elevation wet areas in the Cariboo Mountains. Abundant in Wells Grey Park. The whole plant has a smell of spring, of surging growth, that would be objectionable in a closed room but is not unpleasant in its own habitat. For the record, it does not smell at all like the mephitic spray of the skunk. Bears consume the whole plant, including the short thick rootstock, while deer occasionally browse the leaves. This huge plant is related to the taro, staple food of the Polynesians. Both plants produce a stinging sensation in the mouth, due to calcium oxalate. Ages ago, however, the natives in our area discovered, as did those of the South Seas, that roasting and drying the root drove off the substance responsible for the stinging, burning taste, after which it could be ground to an edible flour. Fraser’s Thimble Farms on Saltspring Island is the only commercial source that I am aware of, but you may be able to acquire this by special order through local nurseries such as Richbar in Quesnel. 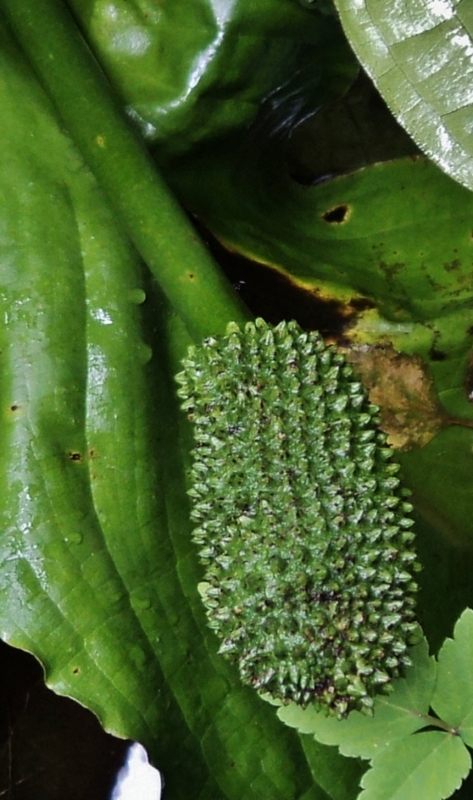 Lysichiton americanus has received the Royal Horticultural Society’s Award of Garden Merit. Perennial. Zone 3. Araceae. Kamchatka Peninsula of northeastern Russia, Sakhalin and Kuril Islands, northern Japan. 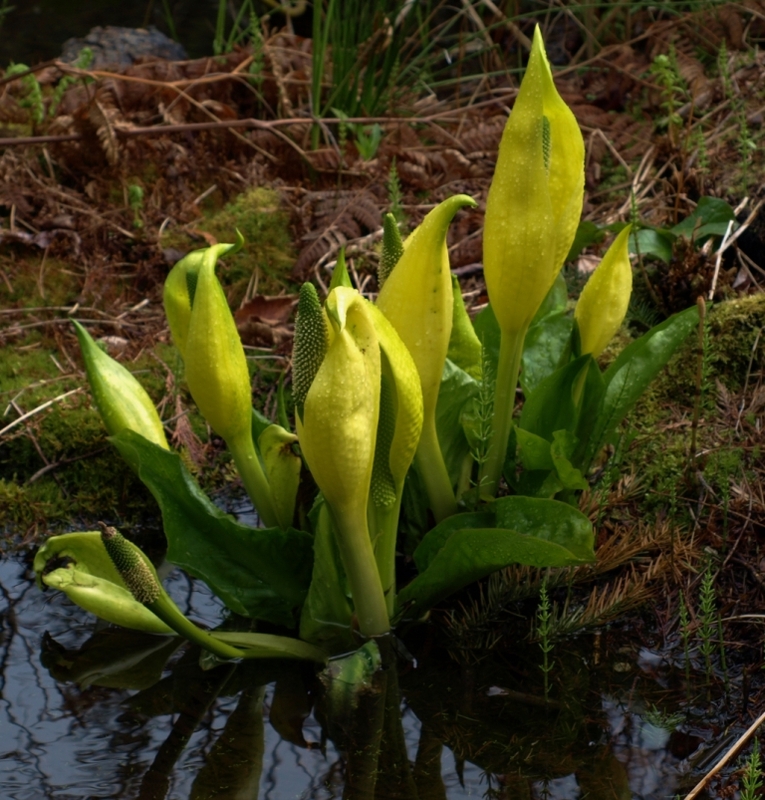 Closely related to the native yellow-spathed Skunk Cabbage, Lysichiton americanus. Very early blooming, emerging through the last of the snow and flowering from late April through May. Big white spathes with a central green spadix packed with tiny green flowers. Large, thick, shiny green leaves. Pollinated by beetles and flies, which are attracted by the somewhat transient fragrance of the flowers. Foliage is musky-scented when bruised, hence the common name. Foliage clumps are 2 to 3 ft. tall. A handsome species for the bog garden, edge of pond or stream, or wet woodland garden. Prefers shade. 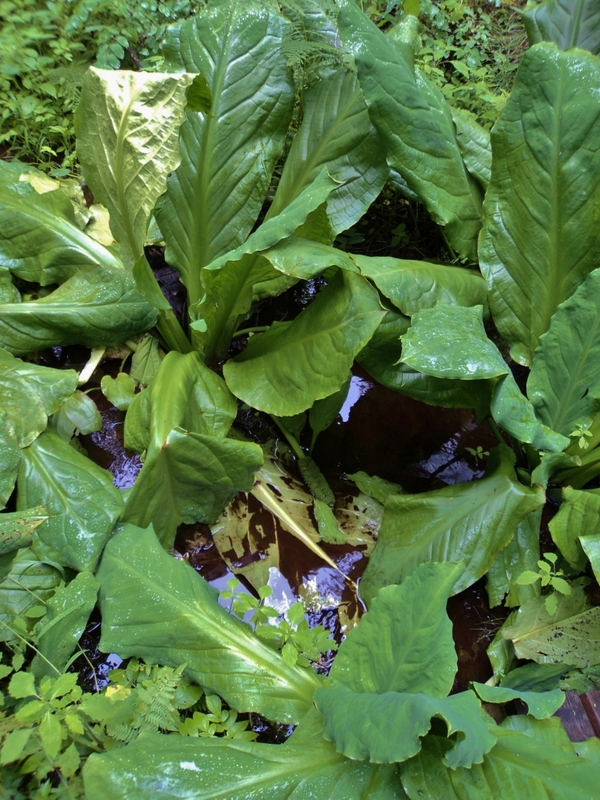 This one thrives in moist conditions, and will require some extra care to establish in Cariboo gardens, though it should prove fully hardy where happy, especially in areas where the native Skunk Cabbage already thrives. 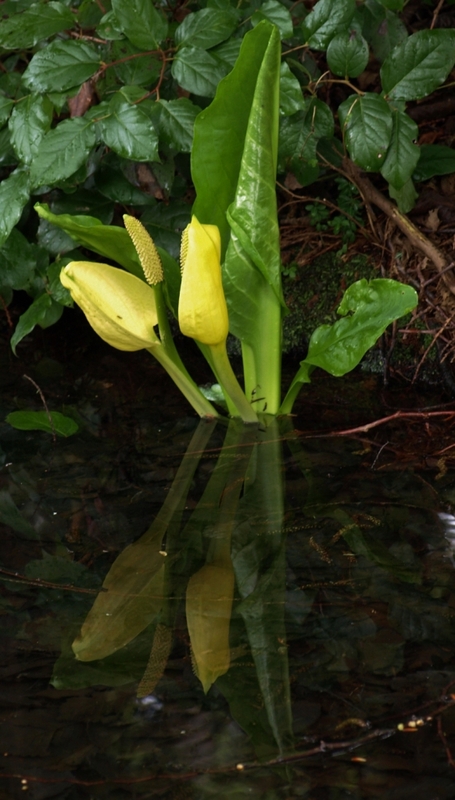 It is reported to hybridize with Lysichiton americanus; offspring will show cream coloured spathes which will be larger and more showy than both parents, according to botanical garden reports from England. Of most interest in earliest spring into early summer, when the seed pods form and the foliage starts to get a bit tired. The “skunky” aroma is not particularly offensive, but it is noticeable when plants are disturbed. Very rare in cultivation in our region; one for the serious collector. Fraser’s Thimble Farms on Saltspring Island is a good place to inquire if you are keen on giving this one a try. Slow growing, taking five years or so to reach full size, but long-lived and problem free once established. Lysichiton camschatcensis has received the Royal Horticultural Society’s Award of Garden Merit.